We all have our lists of comfort foods; foods that warm our hearts and feed our souls. They are foods that calm our nerves and satiate our appetites on days that seem far from perfect. I have a long list of favorite comfort foods and soup is pretty high up on that list. 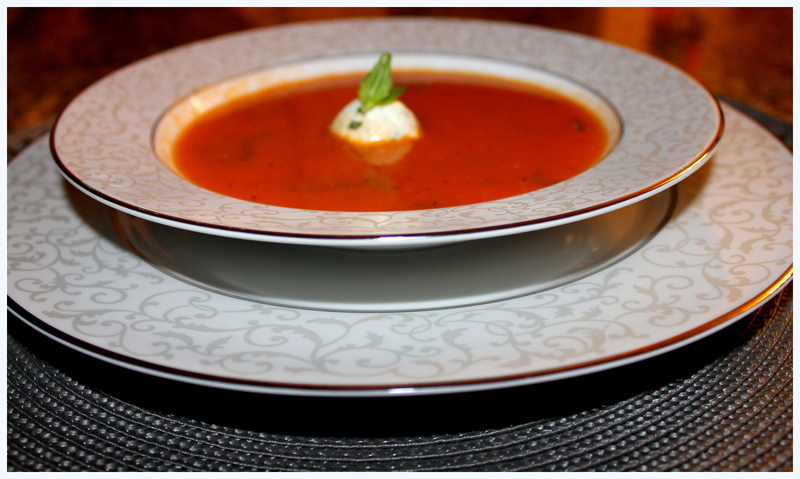 And not just any soup – tomato soup, particularly a roasted tomato soup. By now you know my love for tomatoes, and since tomatoes found in the cooler months of the year are often not at their best, roasting wheedles out the flavor of a less than pristine tomato. A classic roasted tomato soup is a staple around our home in the cooler months, but is an entertaining worthy soup? This is a dilemma I found myself grappling with a few days ago. Since I profess that I feed people’s appetites, I ought to have my fancier, party worthy meals stem for classic comfort food recipes. I need to create dressed up versions of comfort classics that have both the panache of a fancy dinner and the cozy feel of comfort food. This self-imposed mandate was the foundation of this recipe. The herbed goat cheese ball replaces the cream that would traditionally thicken a tomato soup. As it melts into the soup it creates an additional layer of flavor and texture. This coupled with a hint of white truffle oil elevates a comfort classic to celebrity status. 1) Mix together all the above ingredients. 2) Use your hands to form small balls that are just a little smaller than golf balls. Place them on a plate and chill in the refrigerator till the soup is ready. 3) If you have leftover goat cheese balls, they make a great spread for toast or crackers. You can use more truffle oil if you want to. Be aware that it is very strong and a little bit more can have an overpowering flavor. You want to just have a hint of it when you taste the soup. 1) Pre-heat the oven to 450⁰F. 2) Cover a large sheet pan/cookie sheet with foil. 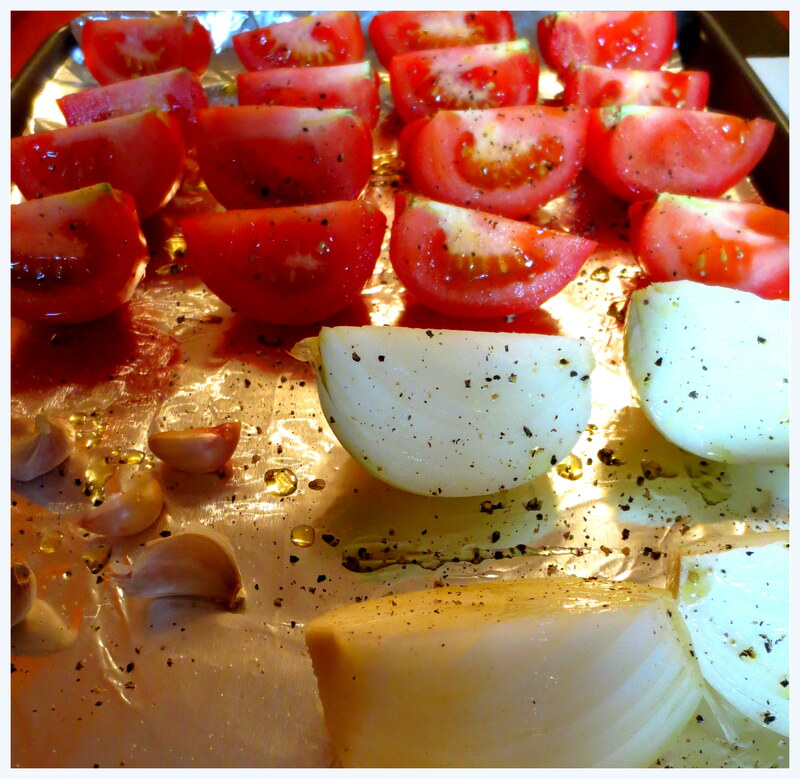 Lay out all tomatoes, onion and garlic cloves on it. Drizzle the vegetables with the olive oil and sprinkle with ½ teaspoon of salt and ½ teaspoon of cracked black pepper. 3) Roast all these vegetables in the oven for 30 minutes. Flip the vegetables over half way through to ensure even charring. 4) Once the vegetables are roasted, bring the chicken stock to a boil along with the bay leaf and oregano in a Dutch oven on the stove top. 5) Add the roasted vegetables and the tomato paste to the boiling broth. Don’t forget to remove the roasted garlic from the peels and discard the peels before adding to the broth. Let everything come up to a rolling boil. 6) Now reduce the heat to medium-low and simmer for 12 minutes. Turn off the heat when done. 7) Using and immersion blender or a food processor, blend everything together. Use a sieve to strain out any seeds. 8) Add salt and pepper to taste. Stir in the truffle oil and basil. 9) Serve the soup in your best soup bowls and top each bowl with one of the goat cheese balls. Hi Neha, Could you suggest a substitute for white truffle oil? That’s a tough one, because the truffle oil really is a substitute for the more expensive truffles.Other mildly flavored oils, such as hazelnut, walnut, garlic or even plain, good-quality olive oil can take the place of truffle oil. Drizzling any of these flavored oils will add a subtle flavoring, although the distinct complexity of the white truffle will be missing. I would say eliminate it and use a good quality extra virgin olive oil. The soup will still taste great from the herbed goat cheese.